China’s stock-market has plunged: its GDP has crashed, the yuan has been devalued and economic confidence is in free fall. Another boom-and-bust bubble has burst: Mammon threatens another tidal wave of devaluation and global contagion. Curious, then, that it is only the churches and other Christian institutions which are being targeted. More curious still is that the cross of Christ is being singled out among all religious symbols. Of course, churches may be built without crosses: it is not an object of worship. But it is the symbol of salvation, and Christians ought to be free to display it within and upon their places of worship, without fear of harassment, monitoring or summary detention. The cross of Christ liberates and redeems: its energy is a revelation of justifying righteousness. If you hide the proclamation of Christ’s death, you eradicate the need for His suffering and so relativise the resurrection. There ceases to be any eschatological dimension because there is no end in sight: history is censored; the truth concealed. Forgiveness may still be found, but you have seek it with more than all your heart and dig very deeply in the underground fellowship of the living. According to China Aid, the persecution of Christians in China is soaring. Their 2014 report – The Year of Persecution and Endurance – makes truly alarming reading. 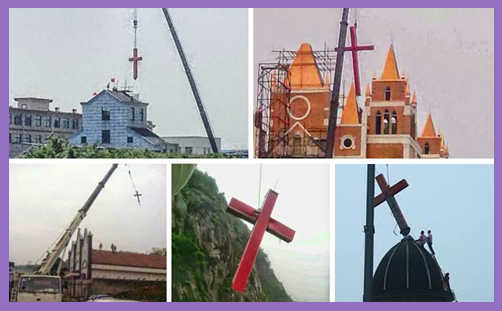 As Christians there multiply (as they are doing), and as the Church there grows (as it is flourishing), they are increasingly perceived by the Communist Party of China to be a subversive and dangerous cult. Christianity corrupts, and corruption must be eradicated. There can be no individual freedom of conscience for the seditious; nor the freedom to express belief for the subversive. Such people are extremists and must be monitored, lest they disseminate their ideological doctrine and propagate their poisonous creed. The state cannot be constrained in the defence of its legitimacy and the assertion of its authority. Only ‘approved religion’ can be sanctioned: the rest is cultic, intolerant and, in the final analysis, ‘extremist’.